A shadowy private security company that has no known clients but claims to have helped foreign governments combat terrorism and will protect anything from cruise ships to Pakistani convoys has taken over a jail in a small Montana town, with plans to build a law enforcement training facility on the property. The state legislature is looking into the matter and residents of Hardin, MT, were alarmed last week when executives from the firm, American Police Force, showed up in the town, which does not have its own police department, with Mercedes SUVs bearing “City Of Hardin Police Department” decals. And the town has had to tamp down reports on conspiracy Web sites that APF plans to impose experimental H1N1 vaccines on residents under threat of quarantine in the jail. Under a lease signed with Hardin, APF, based in Santa Ana, California, and incorporated just six months ago, is now in control of a 400-bed detention facility the town built a few years ago but never used, a town official confirmed to TPMmuckraker today. The town reportedly stands to make over $2 million per year. The 10-year contract that is now awaiting final approval of lawyers gives APF the option of building a training facility, said Al Peterson, spokesman for the Hardin economic development authority. APF has said it plans to invest $30 million in the site, including $17M in the training facility, where law enforcement will get sniper training and learn “DNA analysis” skills. And where is American Police Force getting the money for this venture? Company spokeswoman Becky Shay — until about a week ago the Billings Gazette reporter covering APF — says they are no plans to answer that question. She did not respond to a request for comment. The matter has attracted the attention of the Montana state legislature, which is seeking more information about the arrangement between Hardin and APF. The committee that deals with legal matters will send a letter to Hardin officials to get more details on the deal, Representative Bob Ebinger (D) tells TPMmuckraker. “Because of the apparent secretiveness of this, it gives the far right and far left to come up with all kinds of ideas. That’s why I’d like to see some clarification,” Ebinger says. Peterson, the Hardin official, says the controversy sparked last week when APF executives appeared in black SUVs marked “City Of Hardin Police Department” was a misunderstanding of an act of goodwill by the company. The decals were taken off within the day, he says. Three: The recent Iranian tests of long-range missiles is a purely defensive exercise. Five: Iran has a lot of oil. A whole lot. 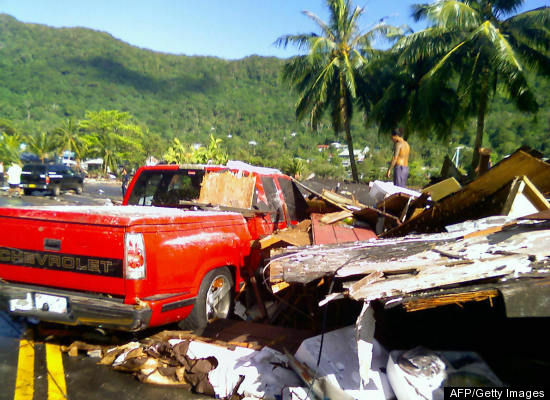 APIA, Samoa — Disaster officials rushed food, medicine and a temporary morgue to the Samoas on Wednesday after a powerful earthquake unleashed a tsunami that flattened villages and swept cars and people out to sea. At least 99 people were killed. Survivors fled the waves for higher ground on the South Pacific islands after the magnitude 8.0 quake struck at 6:48 a.m. local time (1:48 p.m. EDT; 1748 GMT) Tuesday. Four tsunami waves 15 to 20 feet (4 to 6 meters) high roared ashore on American Samoa about 15 minutes after the quake, reaching up to a mile (1.5 kilometers) inland, Mike Reynolds, superintendent of the National Park of American Samoa, was quoted as saying by a parks service spokeswoman. Military transports carrying medical personnel, food, water, medicines and other supplies were headed to the stricken islands. “Right now, we’re focused on bringing in the assistance for people that have been injured, and for the immediate needs of the tens of thousands of survivors down there,” said Federal Emergency Management Agency Administrator Craig Fugate. A Coast Guard C-130 plane loaded with aid and carrying FEMA officials was headed from Hawaii to American Samoa’s capital of Pago Pago, where debris had been cleared from runways to allow for emergency planes to land. “I cannot tell you exactly what kind of damages we had. We’re getting reports just like everyone else that this is a significant impact,” he said. The quake was centered about 120 miles south of the islands of Samoa, which has about 220,000 people, and American Samoa, a U.S. territory of 65,000. Earthquakes and tsunamis have wreaked havoc on multiple nations in Asia and the South Pacific over the past few days, killing hundreds, causing serious damage and sometimes destroying entire villages. Go here for the latest info on the disasters. And look at the slideshow below. Do you have photographs or video of the earthquakes and tsunamis in the South Pacific, Indonesia, Vietnam, Philippines, or elsewhere? Send them to us here. The best ones will be published on the HuffPost. BILLINGS – Confusion and secrecy about American Police Force has grown during the last few weeks. “APF has been here for 10 months but it has never been stealth,” said APF spokesperson Becky Shay at a press conference on Saturday morning. The group announced its plans to fill the $27 million dollar detention facility and build a police training center next to the jail. While they gave details for the site, other questions went unanswered. Where will the prisoners come from? What experience does APF have in prisoners and training police officers? Why was Two Rivers Authority Executive Director Greg Smith placed on administrative leave? During the press conference APF also refused to release any information on its funding or organization “The decision is the name of the parent company will not be released,” said Shay. When questioned about the decision to show up in Hardin last week in vehicles with “Hardin Police” templates, members were brief in their explanation. “They are to show are intentions are good,” said APF leader Captain Michael Hilton. “Why not put an APF logo on it,” said Shay. “You know we’re getting there.” All of the decals were removed from the vehicles two days later. APF has consistently stated the community has nothing to fear and says its plans will help stimulate the Hardin economy. “This corporation’s intention is to buy local and stay local and do local business as much as we can,” said Shay. Residents appear split in their feelings over the company. Some want more information, but others believe it will be a tremendous boost to the area. The company plans to hold a job fair in Hardin the third week of October. Another development this weekend was the naming of Shay as APF’s new public relations director. Shay was a reporter with the Billings Gazette who had covered the detention facility story for last few years. She announced on Friday she was leaving the paper and hosted the APF press conference Saturday morning.